An updated twist on traditional aesthetics inspires this sculpted collection. Featuring an artful design with smooth structural transitions, Clarendon effortlessly coordinates with Amerock's Candler and Extensity decorative cabinet hardware collections, transforming any bath into a relaxing spa. 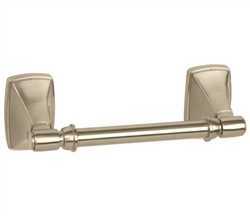 The Amerock BH26507G10 Clarendon™ Pivot Tissue Roll Holder is Finished in Satin Nickel.